College of Charleston Libraries / About / News / Research & Information Services / Joining us in Spring 2016? See our New Student Guide! 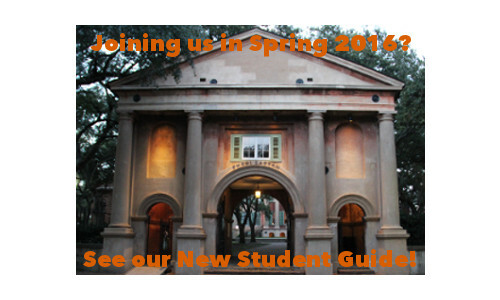 If you are joining us at CofC in Spring 2016, welcome! We’re sure you have many questions, and we’d like to help. For answers to your research and computing questions, please see our New Student Guide. To ask additional questions, visit our Information Desk on the first floor of Addlestone Library or visit us online at http://answers.library.cofc.edu/. See you soon!